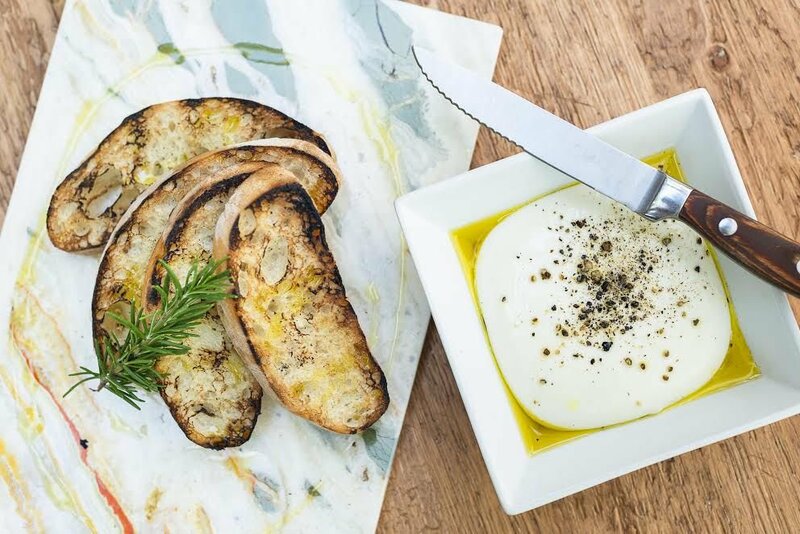 Mozzarella Al Minuto, a favorite at the old Tra Vigne, is on the menu now at Tra Vigne Pizzeria. 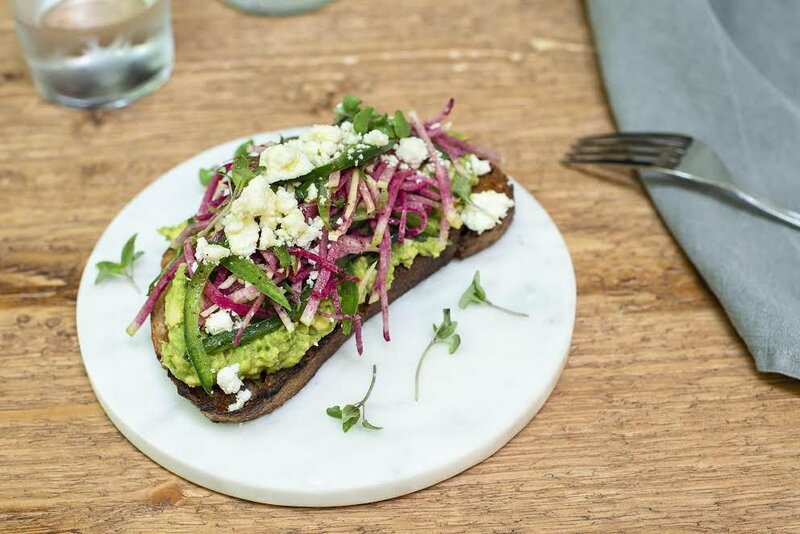 Smashed Avocado Bruschetta is another new addition to the Pizzeria Tra Vigne menu. Chalkboard art at Pizzeria Tra Vigne in St. Helena. The Queen's Pizza at Tra Vigne Pizzeria. At the end of 2015, St. Helena’s Tra Vigne restaurant closed its doors, making way for chef Christopher Kostow’s The Charter Oak. The first in a wave of Napa Valley classics to shutter, it was followed this year by Terra, Cindy’s Backstreet Kitchen, Hurley’s, and most recently, Redd. Yet Tra Vigne’s legacy is not completely lost. The restaurant’s more casual, affordable and family-friendly sibling, Tra Vigne Pizzeria, is not only still open for business, but has even adopted some of the former restaurant’s decor and fan-favorite dishes, including their famous Mozzarella Al Minuto. Moreover, in the last year, Tra Vigne Pizzeria has quietly undergone a total refresh of its ambiance and menu. They have a new Chef de Cuisine, Maria Nuno, who has worked in the kitchens of both the former restaurant and pizzeria since she was 16. She works closely with Executive Chef Anthony “Nash” Cognetti, and is the daughter of David Nuno, former Sous Chef at Tra Vigne. So if it’s been a while, it might be time to revisit Tra Vigne Pizzeria. After Tra Vigne opened in 1986, the pizzeria first opened as Tomatina in 1989 — the Tomatina tomato can still be found at the entrance today — but was renamed Tra Vigne Pizzeria in 1992. Many notable chefs got their start at either the restaurant or pizzeria, like Carmen Quagliata, Dena Marino, Michael Gyetvan, Nicholas Petrilli, Frank Whittaker and Kevin Davis. The first thing you’ll likely notice when you walk in Tra Vigne Pizzeria 2.0 is a series of fun, new chalkboard art over the open kitchen. The project took Oakland artist Jolene Russell a full week to complete. Out back, the patio has been transformed into the perfect spot for a date night and a bocce court has been added, but the biggest changes are to be found throughout the menu, from antipasti to dessert. Many of the classics, like the housemade ravioli, garlic rolls, and minestrone, are still there, but new dishes include Smashed Avocado Bruschetta, Lucky Shucks wood-fired oysters topped with fiscalini cheddar, spinach and charred chili aioli, and even a burger. The C&B Burger comes with a Creekstone Farms chuck and brisket patty served with gruyere, heirloom tomato, watercress, roasted onion and a special sauce. All pizzas and piadinas are now made with a new sourdough crust that’s both thin and delightfully-bubbly. The menu tosses up several fun new pies like the spicy La Bamba (smoky ancho-pasilla chile sauce, chorizo, red onions, jalapeños, cilantro, queso fresco, avocado and crème fraiche) and The Queen’s Pizza. According to Ariosta, The Queen’s Pizza is the true, historical definition of a margherita pizza. It has California-grown Bianco DiNapoli Tomatoes, buffalo mozzarella, whole leaf basil, EVOO and sea salt. Finish your meal with tiramisu, served adorably in a mason jar with ladyfingers, a classic cannoli (ricotta cheese, pistachios, chocolate chunks, citrus) or something you may not expect from an Italian establishment, homemade apple pie. The pizzeria’s new 7-O-7 Happy Hour boasts $1 oysters on the half shell, $5 select craft droughts and well drinks and $7 wine specials seven days a week, from 4-6 p.m. They’ve expanded their craft beer program (now totaling 10 taps) and thanks to a new full liquor license (brought over from Tra Vigne when it closed) have curated an inventive list of rotating, seasonal cocktails. The Weed Whacker, for instance, features hemp seed-infused vodka from Humboldt Distillery, which is owned by St. Helenan Jim Sweeney. Once a month, a local brewery comes in for Pint Night. The brewery pours select beers (get a free glass with your purchase) and often gives away swag to customers who can answer impromptu trivia questions. The next Pint Night will take place on Nov. 14, from 5-7 p.m. with Sonoma County’s Seismic Brewing Company. Ariosta said the pint nights have been a big hit among the wine community especially. A St. Helena restaurant is hoping to catch a break from the city after suffering a $20,000 water leak.